Gold prices fell $6 on Wednesday as the dollar gained against major world currencies for a fourth straight day. A record slide in new U.S. home sales and the Federal Reserve’s less than rosy assessment of the economic recovery were cited actions in pulling down commodities, including crude oil which fell for a second day. U.S. stocks ended mixed during a volatile session which, in the end, resulted in only narrow changes from the closing levels on Tuesday. Major indexes ranged from loss of 0.33 percent to a gain of 0.05 percent. Gold for August delivery declined 0.5 percent to $1,234.80 an ounce. It ranged from $1,225.20 to $1,247.40. Silver for July delivery plunged 44.3 cents, or 2.3 percent, to end at $18.459 an ounce. It ranged from $18.310 to $18.960. July platinum fell $26.00, or 1.6 percent, to $1,567.00 an ounce. It ranged from $1,553.70 to $1,586.00. September palladium plummeted $15.60, or 3.2 percent, to $474.35 an ounce. It ranged from $472.00 to $489.00. "Now that the euro has stabilized, the focus is back on the dollar-and-gold relationship," Frank Lesh, a trader at FuturePath Trading LLC in Chicago, was quoted on BusinessWeek. "There’s just not enough fear and panic to send gold flying. There’s a little disappointment among recent longs that gold is just backing and filling, instead of advancing after making an all-time high." "The weak home sales data led to some liquidation in gold, triggering the sale of some assets. The knee-jerk reaction for gold was to sell off but it has been gradually paring loses," James Steel, chief commodity analyst at HSBC was quoted on Reuters. In PM London bullion, the benchmark gold price was fixed earlier in the North American day to $1,226.50 an ounce, falling $9.50 from the price on Tuesday. Silver gained 29 cents to $18.910 an ounce. Platinum settled at $1,575.00 an ounce, declining $10.00. Palladium lost $2.00 to end at $485.00 an ounce. Crude oil prices fell "as reports showing a supply glut and a record low for U.S. housing sales rekindled fears of weak demand for energy products. A Federal Reserve statement about the state of the economy only added to these worries," wrote Claudia Assis and Polya Lesova from MarketWatch. "Parts of the Fed’s statement were clearly downbeat and that created a quick selling pressure for crude futures," Tom Knight, trader at Truman Arnold, in Texarkana, Texas, was cited on Reuters. New York crude oil for July delivery declined $1.50, or 1.9 percent, to close at $76.35 a barrel. The national average for regular unleaded gasoline rose nine-tenths of a cent to $2.741 a gallon, according to AAA fuel data. The current average is 4.1 cents more than last week, 5.2 cents less than a month back, and 5.8 cents higher than the average from a year ago. U.S. stocks finished mixed "as investors struggled to balance the Federal Reserve’s statement, a weak housing market report and a selloff in commodity prices," noted Alexandra Twin of CNNMoney.com. "The Fed has downgraded where we are in terms of economic growth," David Chalupnik, head of equities at First American Funds in Minneapolis, which manages about $8 billion in stocks, was quoted on Bloomberg. "Equity markets will continue to be volatile with downside risk because of the growth slowdown." The Dow Jones industrial average rose 4.92 points, or 0.05 percent, to 10,298.44. The S&P 500 Index retreated 3.27 points, or 0.30 percent, to 1,092.04. The Nasdaq Composite Index fell 7.57 points, or 0.33 percent, to 2,254.23. Perceptions that the global recovery process could be derailed by certain observed trends sank the euro to a one-week low overnight and reignited at least some of the recently faltering safe-haven quest for gold. Lack of strength exhibited by the European manufacturing sector and the slippage in US existing home sales recorded in May conspired to undermine risk appetite among speculators, especially as expectations were in place for a gain in said sales levels. Meanwhile, sales of new homes in the US might show their biggest drop in nearly 16 years. This, just as the Fed gets ready to judge and then outline its interest rate policy statement later today. Bets that the ‘extended period’ language will be left in place at least until the next tete-a-tete of the FOMC’s decision makers are about as unanimous as those of an election outcome in Cuba. The situation was not the same over in the UK, where the BoE’s minutes revealed a split among policymakers as regards interest rates. BoE Monetary Policy Committee member Andrew Sentance reportedly uttered a sentence calling for a hike in rates; the first such vote in nearly two years, and one based on the ‘resilience of inflation.’ Unlike the US, Great Britain is looking at greater than the (2%) targeted rate for price rises. More like 3.4% as of the last tally. Like the US however, the UK also shows a notable slack in the economy — one that some believe ought to temper inflationary tendencies more than it has. At any rate, Britannia breathed a bit of a sigh of relief this morning as Moody’s Investors Service judges that-based on the UK budget- it is inclined to maintain the country’s Aaa rating as well as the ‘stable’ outlook. Chalk one up for the specs who are not likely to be seeking safe-haven plays on this summer day. No such relief sighs within audible range yet as regards Spain and its banks. China’s central bank offered its reference rate for the yuan this morning and once again drew the attention of traders and financial markets, mainly for the reason that it appears to be extremely slow and cautious in allowing the currency to appreciate. Perhaps tacitly, Mr. Bernanke could be somewhat joyous about the side effect of the latest Chinese policy, as it will likely result in as salutary effect on the two fronts he is apparently most concerned about since…forever: disinflation and jobs growth in the US. Costlier Chinese goods (will Wal-Mart play its price tag demolition commercials in reverse now?) could halt the unwelcome slowing of US inflation levels and a potential rise in Chinese imports might help add some much-needed jobs to the US economy at a better pace than that which has hitherto been noted. If this sounds like shades of Japan’s two-decade-long welcoming of ‘desirable inflation levels’ well, it probably is. At a time when the spec trade is piling into the assets that resemble the proverbial coal mine resident canary (at least in colour) as a safety net against what is supposed to be strong inflation, the reality of falling prices and stagnant labour conditions is what is on the Fed’s mind. Perhaps that was one of the reasons why Mr. Bernanke suggested that he fails to follow why gold prices are doing what they have been doing. Of course, some have interpreted his observations as coming from someone wearing blinders (on purpose perhaps). Par for the course, that. You cannot win, no matter what you say, so long as you say a single word in a certain church. And, if you are not with us, well then, you must be…(you know the rest). Metals markets opened the midweek session with only modest gains this morning. Gold spot advanced $4.20 at the start of the day, and was quoted at $1242.80 on the bid side. However after the first hour of trading, more profit-taking and probable book-squaring/ options expiration-related trades came into the picture and the yellow metal was in the red by about thrice amount of the gains with which it started the session. Yes, a $13 drop was noted in the first 90 minutes of action. $1225 was in sight at last check. In the background, the US dollar lost a bit of ground and slipped to just under the 86 mark on the trade-weighted index while the euro was hovering around the 1.227 mark without much momentum in either direction from that point. Crude oil fell about a quarter to a $77.60 per barrel quote. Later on, the decline steepened and black gold lost almost $2 a barrel. Over in Japan overnight, the Nikkei average lost 189 points reflecting some of the aforementioned fears about where the global economy might be headed. 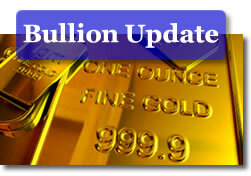 Contrarians continue to remain contained in their reaction to Monday’s gold price action. They note what could well have been a key reversal day following gold’s strong decline from a new record level that day, and Tuesday’s action did not offer much in the way of encouragement. Quite a different mood than that in the bull camp, which continues to bask in the glow of news bits such as ‘Jim Rogers loves gold’ (when did he not?) and "ETF holdings at new peak" while ignoring deteriorating market fundamentals. For Marketwatch’s contrarian sentiment judge Mark Hulbert at least, such reluctance to jump on the gold party wagon by market timers presents a potentially bullish signal. On the technical side of things, the any market notes that contain any variant of the word ‘bear’ are not on the horizon until or unless the price slips nearer to the low $1200’s (like some $30 lower than now). Silver climbed 11 cents at the open, showing a bid of $18.91 the ounce. Meanwhile, platinum gave back $2 to start at the $1581.00 level and palladium advanced $3 to open at $486.00 the ounce. Yet another morning of price stagnation was on tap for rhodium with a $2380.00 quote for the bid. Continued volatility will remain on the plate as options expire and book-squaring gets underway. Turbulence can be expected between now and just after the upcoming 4th of July holiday weekend in the US. For today the obvious focus remains the Fed, and what it might/might not say. The markets will soon judge the Fed’s statement. A small and short-lived interruption to the summer doldrums. No interruption to the unplanned flow of oil into Gulf waters — one that started out with estimates of 1,000 barrels per day gushing out and being lost while causing untold damage. One that –as of the latest tallies-could be 35,000? 60,000? Or perhaps 100,000 barrels per day in size? Final ‘Duh!’ news title of the day. Kid you not: "Spill harming aquatic life, tests show"
In addition to bullion American Silver Eagles that are already available, the United States Mint this year will also issue 5 oz. bullion America the Beautiful Silver Coins that are duplicates of the America the Beautiful Quarters. The first of five coins will be released this summer, with the remaining four to follow in short intervals. Check the above link to visit a sister site to CoinNews for more information on the new series.